The Australian Trellis Door Company™ has designed and manufactured the S04™ Concertina Screen with the DIY customer in mind. These security grills are ideal for keeping your business safe from intruders and unauthorised entry, thanks to the product’s strength and functionality. The S04™ is highly versatile and can be installed to boost the security of doorways and windows in shops, pubs, clubs, schools, offices and many more commercial applications. The Australian Trellis Door Co offers a range of security grille solutions for all types of premises and security coverage. Our range includes DIY options as well as our own onsite installation services. 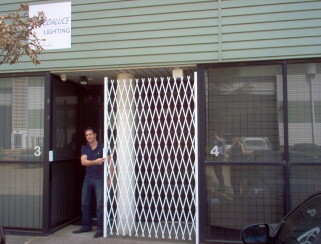 Our security grilles are used Australia-wide in a vast range of business and commercial environments. These very popular security options can be configured to doors, windows, and other access points. View our videos to see some of the many ways our security grilles can be used onsite. If you’re looking for a specific role or have custom requirements for your security needs, we’ll be happy to assist. Our products and services are available all around Australia. View our contact information and get in touch with your nearest ATDC centre for fast, friendly service. If you’d like to learn more about our products or would like to discuss your security options, call The Australian Trellis Door Co or contact us online.